This is a casserole that I have not made in years, but it is sooo good. 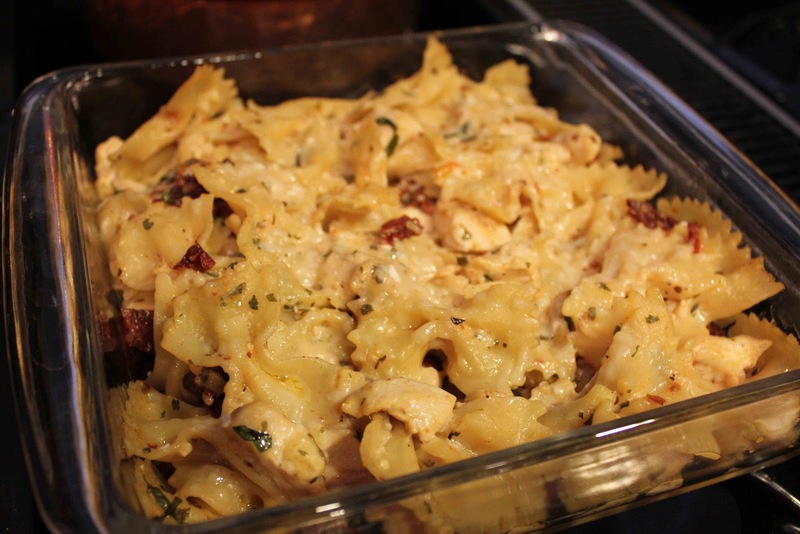 The dried tomatoes add a unique flavor, and who doesn’t love chicken with pasta? I recommend making it the day of because if you let it sit in the fridge until the next day, the sauce soaks into the pasta and it is not as creamy when you bake it. Cook pasta according to package directions; drain. Meanwhile, in a large skillet cook shallots and garlic in hot oil over medium-high heat for 1 minute. Add chicken. Cook and stir for 5 to 7 minutes or until no pink remains in chicken. Carefully add wine, basil, and parsley. Cook for 2 to 3 minutes more. In large mixing bowl combine cooked pasta, chicken mixture, alfredo sauce, dried tomatoes, milk, 1/4 cup of the Parmesan cheese, and pepper. Turn into a 2 1/2 quart baking dish. Sprinkle with remaining Parmesan cheese. Cover and bake in a 350 degree oven for 15 minutes. Uncover and bake for 10 to 15 minutes more or until heated through and top is slightly golden. If desired, garnish with fresh basil. Serving Ideas: Serve with French Bread or breadsticks and a green salad. Notes: *I substituted onions for shallots. Shallots are much smaller than onions, so if using an onion, chop about 1/4 cup. **I substituted chicken broth for white wine. Instead of the prepared alfredo sauce, I prepare a dry packet of McCormick alfredo sauce according to package directions and use that in the recipe…it is less expensive.